Edward Bruce was the younger brother of Robert the Bruce, the King of Scots. 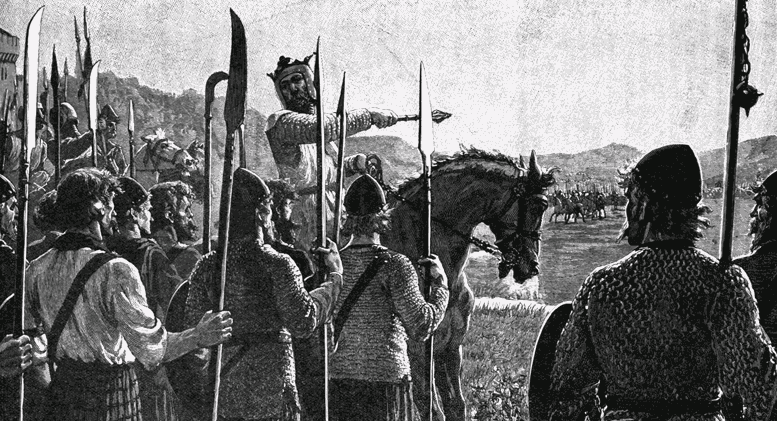 In 1315, King Robert sent his brother to Ireland to create a second front against the Anglo Normans. Edward landed on the north east coast of Ireland on 26 May 1315 with 5,000 men. Facing an army of Anglo-Normans along with their Irish allies they took the town of Carrickfergus but unable to breach its castle. Within weeks Edward had the majority of northern Kings acknowledge him as King of Ireland. This was short lived when he was killed in 1318 during the battle of Faughart. Edwards body was cut into quarters, sent to different towns in Ireland. His head being delivered to the King of England, Edward II. The Civil War in England at the end of the 1400’s gave Ireland a brief break from English authority and the Fitzgeralds of Kildare had Lordship of Ireland. The Irish were beginning to gain more control over Ireland with England really only having much authority in Dublin. A turn around for the regain of control in Ireland was in 1494 with the Poynings Law was introduced; this would see that all power and government decisions would have to be passed over to Westminster in London. Ireland & The Outbreak Of World War 1.